Greene Earth Originals: Fabulous interview with artist Violette Naranjo Clark. 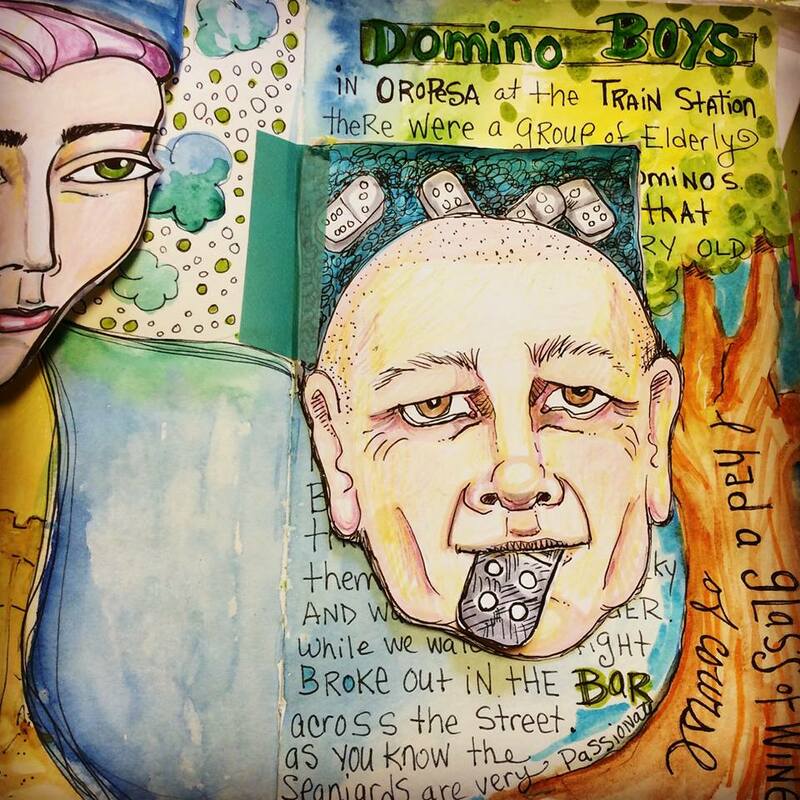 Fabulous interview with artist Violette Naranjo Clark. I'm so delighted to host and interview with acclaimed artist Violette Naranjo Clark. She took time out of her busy schedule to answer a bunch of my questions. 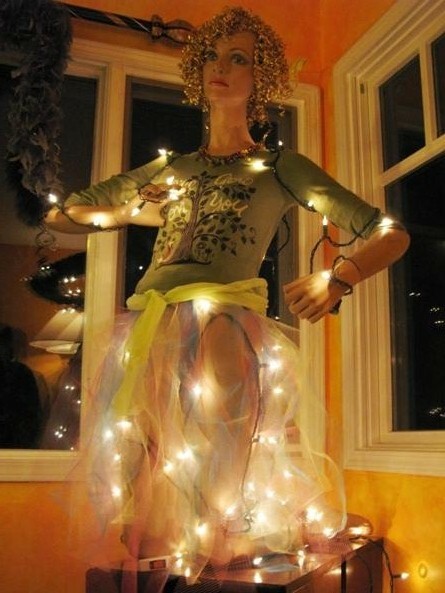 I'm in love with her magical art! Please enjoy. 1. Please tell me about yourself in general. How did you get into art, and at what age? What prompted you to continue exploring art? Has art been like a red thread in your life? I have always loved art and created it ever since I was a little girl. My earliest memory is of drawing faces - particularly Twiggy who was a well known British model. I was 8 or 9 at the time. Drawing and art has always been a saving grace in my life. I would turn to it time and time again for solace and simply to express myself. As a shy child it was a wonderful outlet for me. Some of my other fond memories are of drawing comics with my little sister when we were camping. I kept drawing when I had children, teaching them to draw as well as making a variety of crafts. As a result of this both of my children now have creative careers - one a film maker and the other a Game creator (for his own business). Yes - it's been a red thread in my life, always giving me bliss and saving me at the same time. One other thing that has been a common thread in my life is helping others. Art enabled me to illustrate brochures and articles for non-profit organizations as well as creating art for them. Part of why I love to create art and showcase it on my blog, facebook and instagram is because I love to inspire others to believe in themselves and to embrace their creativity. 2. 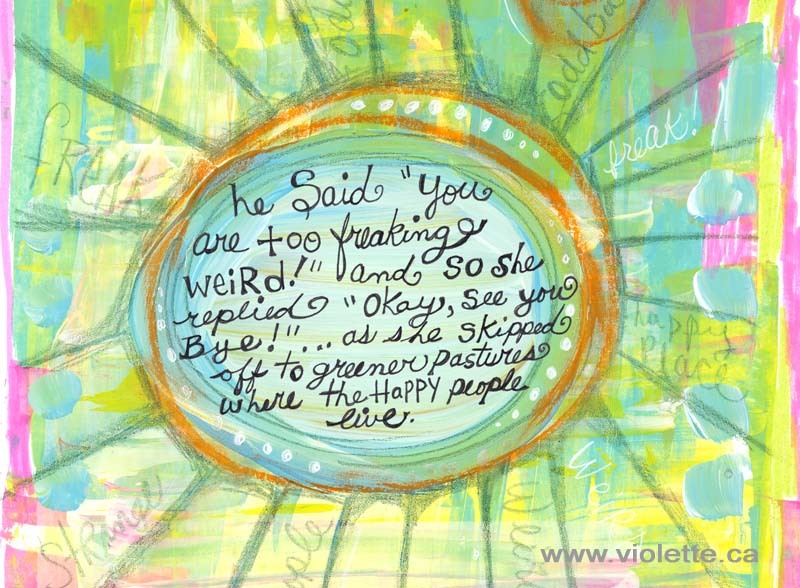 What made you choose to paint whimsical? You have an obvious talent for drawing. Have you done illustrations? Thank you! 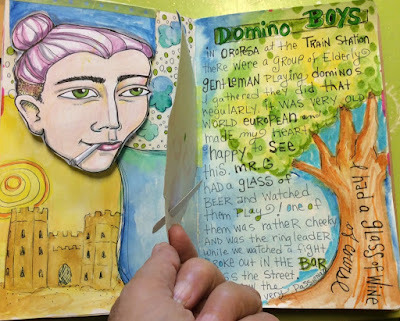 Yes - I have a whimsical bent and am attracted to all things whimsical so naturally that shows up in my art journal pages as well as the illustrations I have created. My illustrations have been featured on Rubberstamps, clipart, greeting cards, , colouring books, bookmarks, prints and bags among other things. 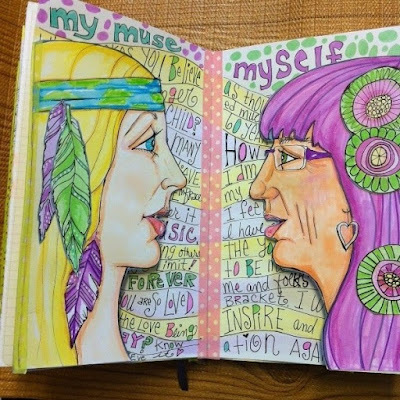 In my book called Journal Bliss the editors wanted me to illustrate the how-tos as well as create the art journal pages. Oh - you're talking about my magic cottage - my sanctuary for all things creative, spiritual and peaceful. Twenty years ago during a major life change I bought this little cottage in a seaside town called White Rock. I surrounded myself with supportive friends whom I affectionately dubbed my Bohemian Tribe - they were creative, spiritual and open-minded. 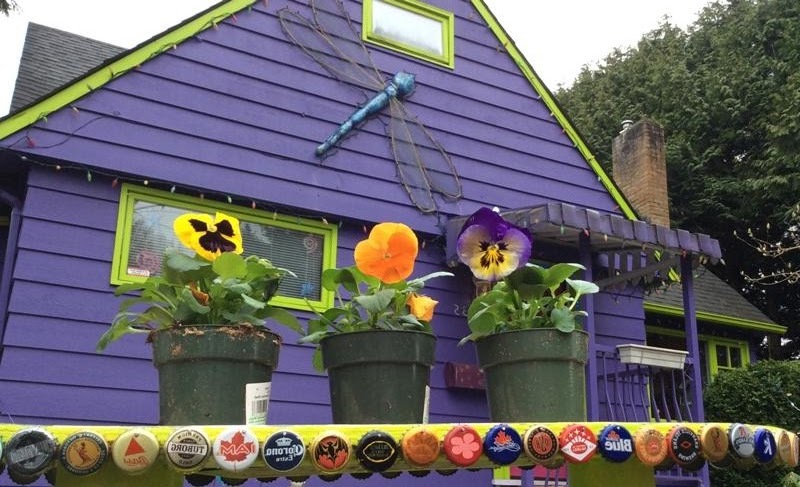 They supported me in all of my wackiness and even helped me paint the cottage in a rainbow of colours. It all came to be in a rather organic fashion. The house was white when I first moved into it and I instantly knew that It had to be purple! It has been purple ever since! Once I had a dream that many of the answers to my questions would be revealed if I began painting my doors. So I painted the doors with all kinds of fun imagery and things truly did unfold magically afterwards. My home was featured on a number of different shows including Weird Homes TV show. It was also featured in magazines and in newspapers. My home and where I live is almost as important as my art - I guess it's a way that I express myself. 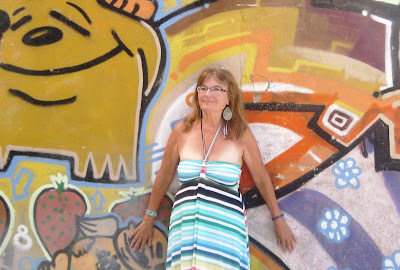 Violette at graffiti wall in Barcelona. 4. Do you like to teach art? Where and what do you teach? How did you get into teaching? 5. In one sentence, what is your art mission? My mission is to inspire women and teens to embrace their creativity through art - self-discovery through art. 6. Who influenced you early on? I have been influenced by the impressionists when I was young and later as a young Mom I was very much influenced by Sark - she basically gave me permission to be who I am and embrace myself totally. My world filled with colour and eccentricity after I began buying and devouring her books. Of course if you are talking about back when I was a teenager I would say my art teacher Mr. Rankin was a big influence on me. 7. Who is your favorite artist(s)? Right now it would be Antonio Gaudi since we just returned from Spain. But I also love the work of many other artists, Chagall, Danny Gregory, Dan Price, Jane Davenport, Suzi Blu, there are so many mixed media artists that I enjoy today - way too many to list! 8. Do you have any art plans for the future, or are you teaching somewhere you would like to mention? I am teaching with LIFEBOOK 2015 and have just finished up teaching at Art Journal Summer School. 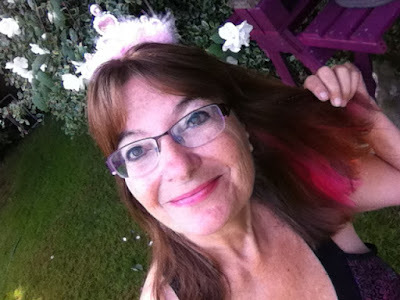 I am planning a licensing program for coaches and teachers of girls and teens so that they can deliver creative healing tools to their young charges. 9. What advice do you have for aspiring artists? My advice is to follow the voice in your heart and don't try too hard to be like other artists. Try not to compare yourself to others either because you have a unique set of gifts to bring into the world which no one else can share. Here's an example. 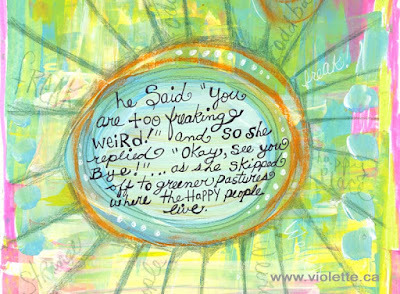 My book Journal Bliss which came out over 6 years ago was all about art journaling. It was one of the first books on journaling…….there were lots coming out about mixed media art. The trend at the time was to have the artists/authors fly in to the publishing house's studio so they could be photographed creating their mixed media pieces. The company did not want to fly me in but wanted me to illustrate the how-tos. I realized that part of what made me unique was my background in cartooning and illustration so I had originally held off showing them my cartoony work thinking they would not like it. In the end that's what made me unique. Also previously, my work and art appeared in Rice Freeman Zachary's book Living the Creative Life. My illustrations also appeared there and I felt that the book and art were quite different from what anyone else was doing. So my point is: it's important to be true to youself and bring all of your unique gifts to your work. Thank you so much Maria for interviewing me - I really appreciate the opportunity to share with your readers. I'm blogging on my website. Hello and welcome to my blog Greene Earth Originals where creativity is alive and inspiration flows. Visual arts of all kinds are my passion, but I have too many interests to count! I spent twenty years as a fiction writer, and I love making polymer clay mosaic art and various crafty things. I've also been a clairvoyant / medium for twenty years. Gardening is also a passion, which might sometimes show up in my art. 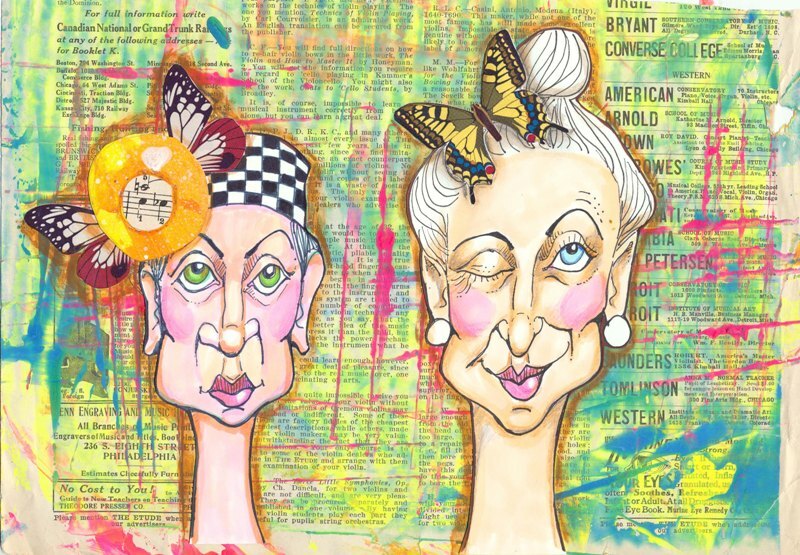 I love painting and mixed media the most--an endless exploration. Art is a demanding goddess! Envy and coming up against challenges. 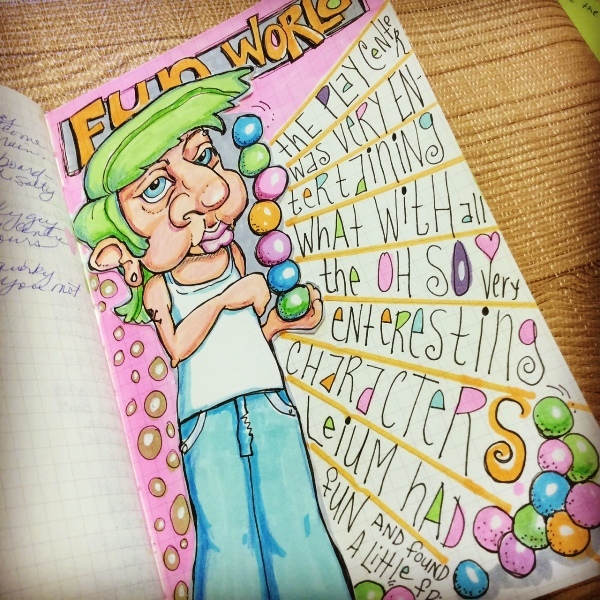 45% off Flash Sale on my art journaling e-course!